Over the last ten years, Common Worship has introduced a vast range of structures and rich resources for worship. However, many worship leaders remain unclear as to exactly what Common Worship contains and unsure as to how they can use it. Drawing on the author's wealth of experience as the Church of England's National Worship Development Officer, "Crafting Common Worship" is a highly practical guide to how to make the most of Common Worship. 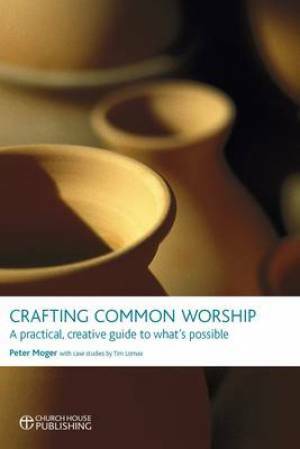 Crafting Common Worship by Peter Moger was published by Church House in October 2009 and is our 27698th best seller. The ISBN for Crafting Common Worship is 9780715142011. This is both a useful guide to planning services using Common Worship and a celebration of Common Worship’s implications for contemporary worship. Its core message is that worshipping communities are encouraged to be flexible even within familiar liturgical contexts. It tells how to find resources for many different occasions and congregations from the many volumes of Common Worship. It explains what canon law allows and discourages. Its ‘Case Studies’ range from familiar liturgical services to Fresh Expressions, and an experimental ‘All-age liquid worship’; they cover Holy Communion, Services of the Word, and Pastoral Services. Above all, it claims that Common Worship enables the Church to reach new parts of the community. But it does assume leaders of worship have an existing familiarity with liturgical worship. It is a book for insiders. Got a question? No problem! Just click here to ask us about Crafting Common Worship.